Welcome to the Rainbow Directory, a listing of LGBTQ-supportive businesses, healthcare providers, therapists, groups & organizations. 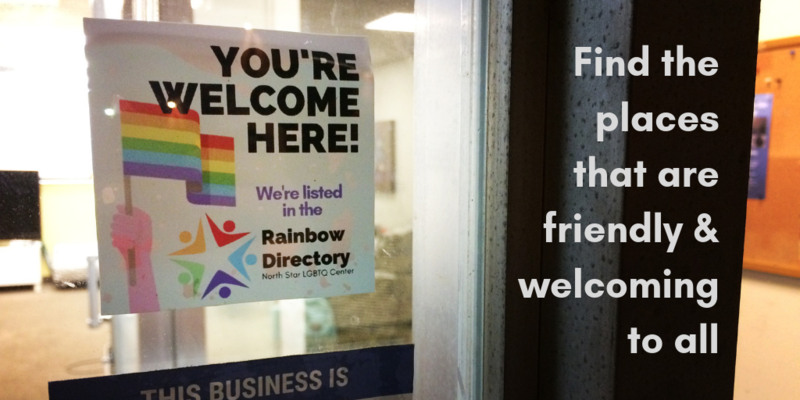 Our goal is to help LGBTQ folks find spaces where we can be ourselves and find support, while out-and-about in our larger Winston-Salem community. Want to be listed on the Directory? Fill out our form. **Coming soon! ** Sections for: physical and mental healthcare providers, legal services, faith communities, and education services. We appreciate your patience as we build out this Directory! Qnotes is the LGBT arts, entertainment and news publication based in Charlotte, N.C., a trusted source of news, politics, opinion, entertainment, art, lifestyle, community events and more for LGBT North Carolinians and South Carolinians. OUT at the Movies is Winston-Salem and North Carolina’s LGBT Film Series, including regular showings throughout the year and the October Film Fest. Pride Winston-Salem hosts the annual Pride festivities and much more. Their mission is to celebrate our culture, honor diversity, inspire engagement, promote inclusion, provide community outreach, and educate our friends, allies, and supporters on equal rights for all. PFLAG Winston-Salem serves the GLBT community and their families and friends through various offerings and activities, including a monthly chapter meeting, social events, special-interest programs, educational workshops and awards banquets to recognize those who have promoted acceptance in our community. The Theatre Alliance is Winston-Salem’s community theater company since 1983, with a mission to inspire, transform and unite the people of the Triad through a broad range of unique, diverse, and unconventional theatrical experiences. Astrology for Growth offers supportive, interactive astrological consultations to help people reconnect & recharge with their core energies and purpose, and explore the deeper meanings of life challenges. A Security Consulting service providing background checks, risk management assessments, special event preparedness, crowd control policies, and pre employment screening. Susan Brittain Consulting is an NGLCC certified business specializing in nonprofit management; grant research, writing, and management; and, entrepreneurial start-ups. White Rabbit is the #1 shopping destination for the LGBT community in Charlotte. We have an array of Cards, Books, Movies, Stickers, Jewelry, Magazines, Gift Items, Designer Underwear, Swimsuits Pridewear & more. RayCoach, founded by gay Latino executive coach Ray Pifferrer, provides leadership coaching and training for underrepresented leaders around the world. Cash Lovell Stables brings horse and horse lover together. Their services include a riding academy, horse boarding facilities, party and wedding venue, and more. A photography service offering wedding photography, headshots, and portrait services. Twin City Hive is a locally acclaimed coffee shop that offers baked goods, chocolates, espresso, coffees, teas, cookies, and local goods. Computer And Technology Solutions Inc.
Computer And Technology Solutions, Inc. designs, installs, and supports Local And Wide Area Network (LAN and WAN) infrastructures for small and medium businesses. A GREAT !DEA is a powerfully small, globally experienced, empathy-led content and creative partner in graphic design, development, and strategy, build the brands of organizations and companies locally and nationally as an LGBT-certified business. Camel City Yoga teaches Bikram Method Hot Yoga and Inferno Hot Pilates. Tart Sweets is a locally owned and operated cakery and coffee shop located in the historic Rosenbacher home on Fifth Street in the West End neighborhood. On our counter you will always find the freshest of desserts baked fresh daily using high quality raw ingredients and absolutely no preservatives. Family Service of the Piedmont focuses on building safe and healthy families in the Piedmont Triad. We serve clients of all identities and backgrounds addressing issues of domestic violence, child abuse, mental health and financial stability. Optical boutique specializing in the finest eyewear and eye care in Winston Salem. The Triad’s Premiere Multi-Cultural & Inclusive Wedding Show. Therapeutic Massage, Bodywork, and Massage Therapy. Bookmarks is a literary arts organization that fosters a love of reading and writing in the community. Our programming connects readers and authors and includes: an annual Festival of Books, and Authors in Schools program, and year-round events in our community gathering space and nonprofit independent bookstore. M Creative is a values-driven strategic communications firm providing marketing and design services to visionary organizations so they can do more good for more people. The Travel Genie, LLC provides the professional services of travel professionals. They want the possibility of an amazing travel experience to be available for their customers for they can learn from other cultures and themselves. Cowboy Brazilian Steakhouse is a unique, Award Winning “Churrascaria” featuring a Fresh Salad Bar with over 30 items, 6 Hot Brazilian Flavored Dishes and a “parade” of 16 USDA Prime cuts of Beef, Lamb, Chicken and Pork carved tableside by our Gauchos. To complement your meal, we have a full bar offering a worldwide selection of fine wines, cocktails, typical Brazilian mixed drinks and a tasteful selection of desserts. A mobile boutique that travels throughout North Carolina to spread kindness and positivity, create community connections, and give back to those in need. Washington Park Barber Shop has 8 full-time barbers offering precise cuts and detailed grooming with warm lather and hot towels used on every adult cut. Glass Door Salon & Spa is a hip downtown salon and spa located in the heart of Winston-Salem. They offer a wide variety services for your hair, nails, makeup and body. Camino Bakery makes traditional breads and pastries from scratch as well as specialty coffee and tea beverages, and seeks to be an open and welcoming community center for all in Winston-Salem. Fearless is a collaborative collective and clubhouse for and by women and non-binary folx in Winston Salem. Thrift & Consignment Store in Winston-Salem, North Carolina. Tropical Smoothie Cafe is a restaurant franchise that serves smoothies, sandwiches, wraps, salads, flat breads, and bowls. Pour artist out of Raleigh, North Carolina. A Community Yoga Studio. It’s how we come together in shared practice and collective action for our community. Stonewall Sports – Greensboro is an LGBTQ & Ally not-for-profit sports league in Greensboro, NC and one of 14 Stonewall Sports leagues in the eastern United States. Real Estate Agent out of Winston Salem, North Carolina. Certified Professional Dog Training and Animal Behavior Consultations. Eco-friendly cleaning for your home or business that is the current biggest value for your buck.